Sales volume. Overall, up 10.61%. YoY, condo sales volume was up a robust 12.62% and home sales volume increased 8.72%. All but two categories of single family homes experienced positive growth in sales volume. Dollar volume. In aggregate, up a whopping 17.92%. 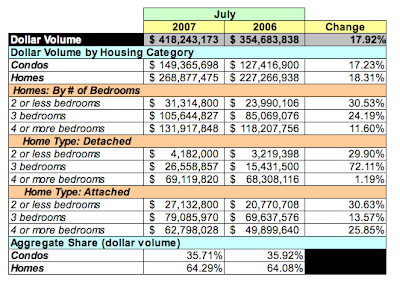 Dollar volume for condos rose 17.23%, homes did better, up 18.31%. All categories of housing had positive growth in dollar volume YoY. Average sales price. Up 6.61%. Average prices for condos were up 4.09% to $408,103, but that average price was about $20,000 less than June's. Homes did well, up 8.82% to $718,924, well above June's $659,314. Days on market. Yes, on average the DOM grew to 60 days, but a closer look shows that more than 2/3 of all homes [69.5%] sold within 60 days. Inventory. Based on July's transaction rates and active listings, there is a 4.24 month's supply of condos, a decrease of 13.41% over June, while home inventories fell 13.08% to 4.16 months. 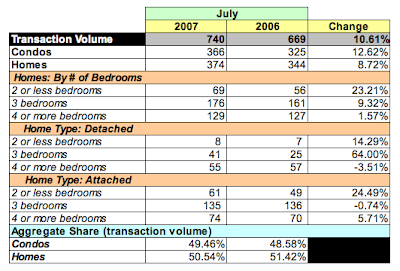 Looking at July's data to see whether a "Chase Point" effect may be in play, I find that 9.9% of purchased units were sold for more than $1MM compared to 8.5% in July 2006, but MRIS' data lacks the granularity necessary to see whether that skewed the month's results. I guess we wait for August's data to see whether July was an anomaly or the beginning of a late summer buying season. 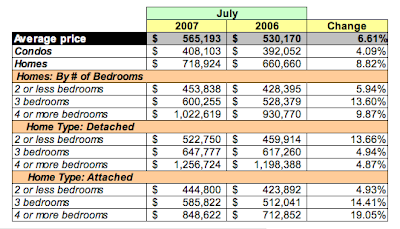 Isn't the inventory of DC condos still outrageously high? Something like 3 years of inventory to be absorbed? In terms of what's in the development pipeline, I don't have the data to determine the level of inventory to be absorbed, i.e., how many years worth. My records show that almost 4400 condo sales were recorded in the District in 2006 [existing and new]; MRIS says that 3772 existing condos were sold in DC that year. MRIS reports that 1553 condos were listed for sale in July. While I've heard that anywhere from 20,000 to 40,000 condos are in the development pipeline in the metro area, I don't know how many are being planned/built in DC proper, which is what I would need to know the absorption level. Another interesting question is how many condos remain unsold in new, recently "delivered" buildings. I'm researching the Sonata right now and as of today, the District shows that twenty have either not been sold or haven't had their deeds recorded. I'll Google around to see if I can find that data - the DC development pipeline. If I find the data, I'll post my findings here. what is the "chase point effect" you refer to? Refer to my posting about June 2007 sales. In it, I describe the inordinate impact that month's sales at the Chase Point condos had on District-wide average and median prices for condos. I've dubbed this the Chase Point effect [TM].